During the early days of the industrial revolution, thousands left their farms for work in Massachusetts’s growing cities of industry. Later, immigrants came to work in the great mills. Together, these forces changed indelibly our natural and cultural landscape. This day trip links three Department of Conservation and Recreation facilities through the story of MA’s transition from a farming community to an industrial society. Begin your trip at Great Brook Farm State Park to see an example of the landscape from which mill workers originally came. Examine a display of agricultural history, and then take a walk among the fields and forest. In Lowell, see how the power of the Merrimack River transformed Lowell into an industrial center. Drive along the Merrimack, looking across at the industrial landscape it enabled. Complete your trip at Lawrence Heritage State Park, where waterpower, the planned city, and immigration are illustrated in its engaging museum exhibits. This isn’t really a secret, since it’s an Audubon trail, but the High Ledges in Shelburne are beautiful. To get there you take Route 2 (Mohawk Trail) West from Boston, take a right at the sign for Davenport’s Sugar House, and then follow the signs to the High Ledges. The signs are small and wooden, not big road signs. The walk is an easy, flat 30 minutes, and the view of the Deerfield Valley when you get to the ledges is spectacular. Great for little kids or older folks. 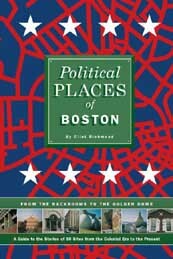 Many of the places covered in the guidebook Political Places of Boston are located downtown or in adjacent neighborhoods. Walking is a wonderful to visit these places. This guidebook complements the other walking tours of Boston such as the popular Freedom Trail. However, if you limit yourself to the Freedom Trail, you will miss several, important, downtown political sites. Click here for a fascinating, in-depth tour that brings you back to where you began. Take the book with you for a complete experience. Many DayTrippers are planning spring and summer travels already, and this one’s fairly close to home. Magic Falls Rafting Company is celebrating their 20th birthday on Maine’s wilderness rivers this season. Owners Dave and Donna Neddeau, invested their savings to buy a raft, van and house trailer in 1989 and carried 38 passengers the first year. Today, the company is still family owned and operated with 41 rafts, 25 inflatable kayaks, a campground, lodge and inn for groups; recreation pavilion, retail shop on 15 acres alongside the Dead River. 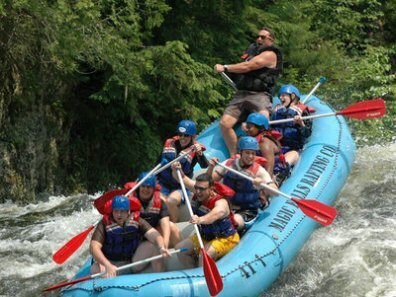 In 2008 the Neddeaus carried more than 6,000 rafting passengers. Note that Magic Falls is also hiring fit & experienced 18-plus guides for the summer. You can visit nearly 300 renowned science centers or museums in countries like Italy, Sweden, Beijing, or Capetown—for free! 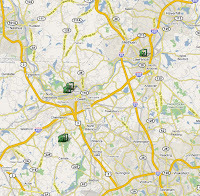 First, join your local participating science center or museum (like Museum of Science, Discovery, or HMNH). Then check the ASTC Passport Program list to find other participating museums where you will be traveling. There are now 290 affiliated museums and science centers in over a dozen countries around the world. CRAFTBOSTON will open to the public March 27-29 with 200 contemporary craft artists, a lecture series, an artist mentor program, and of course, amazing art, including stained glass by DayTripper friend Dan Maher. DETAILS: Kick off the maple sugaring season by helping tap approximately 200 maple trees around Weston. Land’s Sake staff will provide a tapping demonstration and participants will be divided into groups and assigned to various locations across town. After the event, convene at the Bill McElwain Sugar House for some hot cocoa and cookies! Land’s Sake is limiting this event to 50 people, so RSVP is required. REQUESTS: Land’s Sake will provide most of the supplies, however, participants are encouraged to bring their own power drill and a 5/16″ drill bit, if availalbe. This will allow for more people to be tapping at the same time. Please be on time, as groups will disperse to various locations. RSVP: Dave Quinn; (781) 893-1162; dave@landssake.org. We love Diva Radio on our whole-house Sonos music system – Click here to request a Dispatches exclusive!